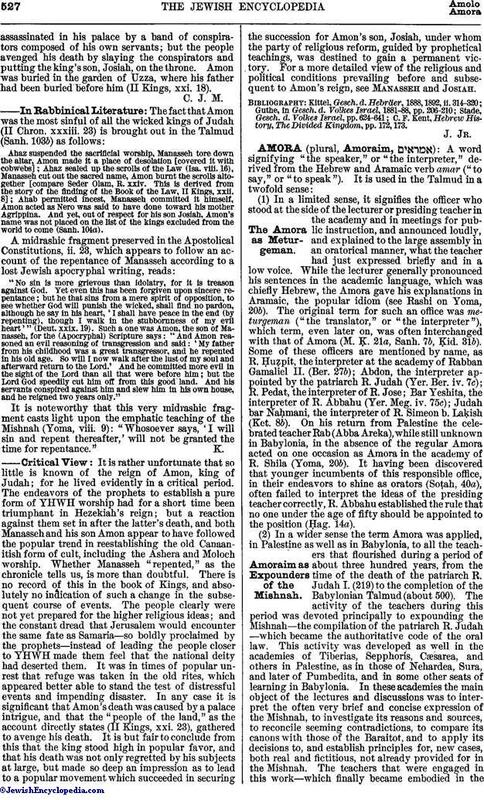 Amoraim as Expounders of the Mishnah. (1) In a limited sense, it signifies the officer who stood at the side of the lecturer or presiding teacher in the academy and in meetings for public instruction, and announced loudly, and explained to the large assembly in an oratorical manner, what the teacher had just expressed briefly and in a low voice. While the lecturer generally pronounced his sentences in the academic language, which was chiefly Hebrew, the Amora gave his explanations in Aramaic, the popular idiom (see Rashi on Yoma, 20b). The original term for such an office was meturgeman ("the translator," or "the interpreter"), which term, even later on, was often interchanged with that of Amora (M. Ḳ. 21a, Sanh. 7b, Ḳid. 31b). Some of these officers are mentioned by name, as R. Ḥuẓpit, the interpreter at the academy of Rabban Gamaliel II. (Ber. 27b); Abdon, the interpreter appointed by the patriarch R. Judah (Yer. Ber. iv. 7c); R. Pedat, the interpreter of R. Jose; Bar Yeshita, the interpreter of R. Abbahu (Yer. Meg. iv. 75c); Judah bar NaḦmani, the interpreter of R. Simeon b. Laḳish (Ket. 8b). On his return from Palestine the celebrated teacher Rab (Abba Areka), while still unknown in Babylonia, in the absence of the regular Amora acted on one occasion as Amora in the academy of R. Shila (Yoma, 20b). It having been discovered that younger incumbents of this responsible office, in their endeavors to shine as orators (Soṭah, 40a), often failed to interpret the ideas of the presiding teacher correctly, R. Abbahu established the rule that no one under the age of fifty should be appointed to the position (Ḥag. 14a). (2) In a wider sense the term Amora was applied, in Palestine as well as in Babylonia, to all the teachers that flourished during a period of about three hundred years, from the time of the death of the patriarch R. Judah I. (219) to the completion of the Babylonian Talmud (about 500). The activity of the teachers during this period was devoted principally to expounding the Mishnah—the compilation of the patriarch R. Judah—which became the authoritative code of the oral law. This activity was developed as well in the academies of Tiberias, Sepphoris, Cæsarea, and others in Palestine, as in those of Nehardea, Sura, and later of Pumbedita, and in some other seats of learning in Babylonia. In these academies the main object of the lectures and discussions was to interpret the often very brief and concise expression of the Mishnah, to investigate its reasons and sources, to reconcile seeming contradictions, to compare its canons with those of the Baraitot, and to apply its decisions to, and establish principles for, new cases, both real and fictitious, not already provided for in the Mishnah. The teachers that were engaged in this work—which finally became embodied in theGemara—were properly called Amoraim; i. e., interpreters or expounders (of the Mishnah). They were not as independent in their legal opinions and decisions as their predecessors, the Tannaim and semi-Tannaim, as they had not the authority to contradict decisions and principles unanimously accepted in the Mishnah itself or in the Baraitot. 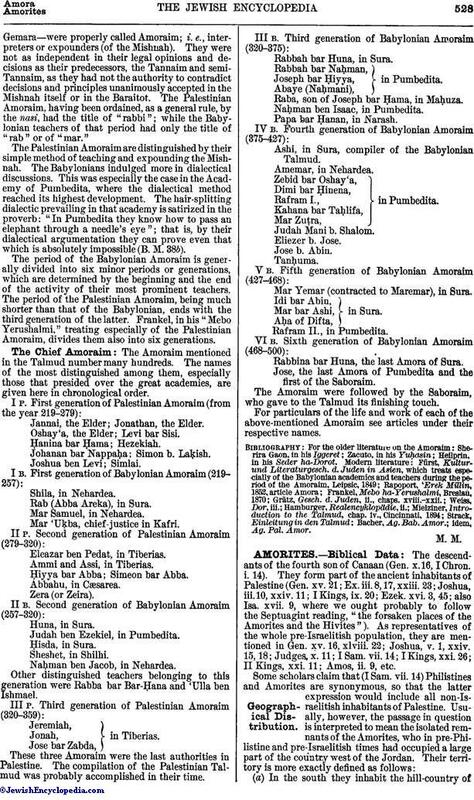 The Palestinian Amoraim, having been ordained, as a general rule, by the nasi, had the title of "rabbi"; while the Babylonian teachers of that period had only the title of "rab" or of "mar." The Palestinian Amoraim are distinguished by their simple method of teaching and expounding the Mishnah. The Babylonians indulged more in dialectical discussions. This was especially the case in the Academy of Pumbedita, where the dialectical method reached its highest development. The hair-splitting dialectic prevailing in that academy is satirized in the proverb: "In Pumbedita they know how to pass an elephant through a needle's eye"; that is, by their dialectical argumentation they can prove even that which is absolutely impossible (B. M. 38b). The period of the Babylonian Amoraim is generally divided into six minor periods or generations, which are determined by the beginning and the end of the activity of their most prominent teachers. The period of the Palestinian Amoraim, being much shorter than that of the Babylonian, ends with the third generation of the latter. Frankel, in his "Mebo Yerushalmi," treating especially of the Palestinian Amoraim, divides them also into six generations. The Amoraim mentioned in the Talmud number many hundreds. The names of the most distinguished among them, especially those that presided over the great academies, are given here in chronological order. Jannai, the Elder; Jonathan, the Elder. Oshay'a, the Elder; Levi bar Sisi. Johanan bar Nappaḥa; Simon b. Laḳish. Rab (Abba Areka), in Sura. Mar 'Uḳba, chief-justice in Kafri. Eleazar ben Pedat, in Tiberias. Ammi and Assi, in Tiberias. Ḥiyya bar Abba; Simeon bar Abba. Judah ben Ezekiel, in Pumbedita. Naḥman ben Jacob, in Nehardea. Other distinguished teachers belonging to this generation were Rabba bar Bar-Ḥana and 'Ulla ben Ishmael. These three Amoraim were the last authorities in Palestine. The compilation of the Palestinian Talmud was probably accomplished in their time. Rabbah bar Huna, in Sura. Rabbah bar Naḥman, in Pumbedita. Raba, son of Joseph bar Ḥama, in Maḥuza. Naḥman ben Isaac, in Pumbedita. Papa bar Ḥanan, in Narash. Ashi, in Sura, compiler of the Babylonian Talmud. Zebid bar Oshay'a, in Pumbedita. Mar Yemar (contracted to Maremar), in Sura. Idi bar Abin, in Sura. Rabbina bar Huna, the last Amora of Sura. Jose, the last Amora of Pumbedita and the first of the Saboraim. The Amoraim were followed by the Saboraim, who gave to the Talmud its finishing touch. For particulars of the life and work of each of the above-mentioned Amoraim see articles under their respective names.